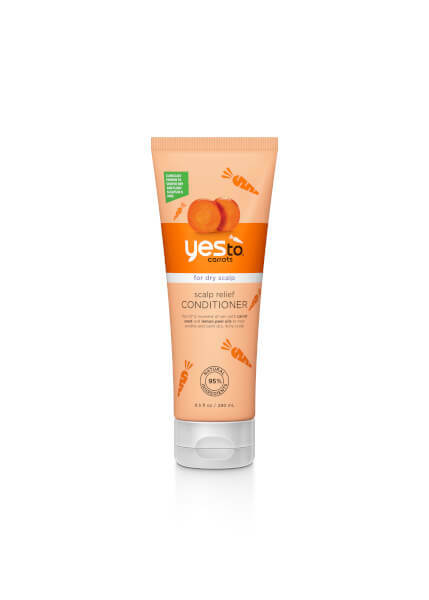 Soothe dry, itchy scalps with the Yes To Carrots Scalp Relief Conditioner; a plant-based treatment that helps protect and nourish skin, relieving and preventing further irritation. Infused with an emollient-rich blend of Carrot, Tea Tree and Lemon, the gentle yet effective conditioner softens and cleanses locks with the addition of astringent Salicylic Acid working to eliminate flakes in as little as 7 days. Experience a refreshing tingle and healthy-looking hair with a comfortable scalp. After shampooing, take a generous amount of conditioner and massage through hair. Rinse. Yes to a soft, tingling head of hair to start your day off right! Water (Aqua), Cetearyl Alcohol, Behentrimonium Chloride, Cetyl Esters, Salvia Officinalis (Sage) Oil, Citrus Limon (Lemon) Peel Oil, Cupressus Sempervirens Oil, Melaleuca Alternifolia (Tea Tree) Leaf Oil, Menthol, Niacinamide, Salicylic Acid, Silk Amino Acids, Aleurites Moluccana Seed Oil, Daucus Carota Sativa (Carrot) Seed Oil*, Ipomoea Batatas Root Lees Extract, Guar Hydroxypropyltrimonium Chloride, Fragrance (Parfum), Sorbic Acid, Phenoxyethanol. *Certified Organic Ingredient.